run far away from the woods. In the fall of 1998, as he was recovering from cancer, Ted Kooser, still six years away from being the thirteenth Poet Laureate of the United States, began taking walks. Because he was supposed to stay out of the sun, he walked in the early morning darkness. At that point in his illness, he hadn’t been writing for some time; but one morning in early November, after his walk, he found himself writing again. And then every day. He started pasting his morning poems on postcards and mailing them to his friend Jim Harrison. 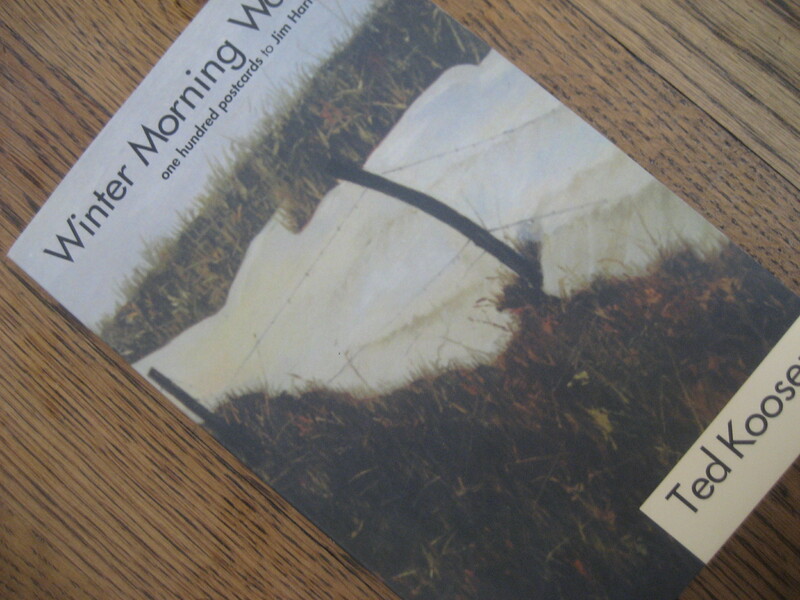 Winter Morning Walks is a collection of one hundred of these poems. Some of you may have noticed a slight change in the photograph header for the blog. As a nod to the winter months, the shorter days, and the changing light, I thought we would look at the world in black and white for a while. Maybe we’ll see something we hadn’t noticed in all the brightness of color.